Bo and his son, Trent, had a really remarkable fly fishing trip last week. They met up with their friend, Steve Bechard, who owns Rise Fishing Company, a fly rod manufacturer, in East Hampton, New York. 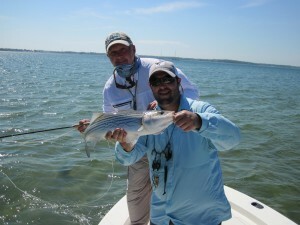 Steve is also an expert at chasing Striped Bass all up and down Long Island, New York and just like the Florida Keys this is sight fishing from a flats boat using 8wt. fly rods. 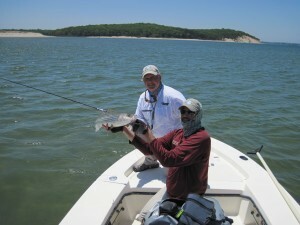 The fly pattern is that of an eel which is one of the primary food sources for the Striped Bass. It is hard to believe that you can catch these wonderful fish on fly, in a couple of feet of water, within sight of the skyline of New York City, at the end of the runway at JFK International Airport, or just in front of thirty million dollar beach houses in The Hamptons and below the two hundred year old light house on the point of Montauk. Although the boys did not have the best weather conditions they still hooked-up some nice Striped Bass as well enjoying all the great seafood of the northeast. There are plenty more photos in the “Gallery” section of the website. If you want to go give this wonderful fishery a try just contact us at Empty Creel Fly Fishing Guides and Outfitter and Bo will be glad to help you set up a trip. It is hard to top catching Striped Bass on the flats and then having dinner on 5th Avenue in New York City! !